Toshikatsu Matsuoka (松岡 利勝, Matsuoka Toshikatsu, 25 February 1945 – 28 May 2007) was a Japanese politician. He served as the Minister of Agriculture, Forestry and Fisheries from 26 September 2006 under the Abe cabinet. He committed suicide in 2007 in the middle of a financial scandal. He was born in Aso, Kumamoto, Kyūshū on 25 February 1945. His family were farmers. After graduating from high school in Kumamoto city, he joined Tottori University in Tottori Prefecture and studied agricultural science. He graduated in 1969. After graduation, Matsuoka joined the Ministry of Agriculture, Forestry and Fisheries. In 1990, he resigned as the spokesman of the Forestry Agency and ran for the Kumamoto first constituency in the parliamentary election. He won this election and later joined the Liberal Democratic Party (LDP). Matsuoka was a member of the political faction headed by Shizuka Kamei in LDP. Kamei was one of the fiercest opponents of the postal privatisation bills proposed by then prime minister Junichiro Koizumi, and Kamei and most of his faction defected from the LDP in 2005. Matsuoka stood with Koizumi, and after the general election he was appointed as a member of the special committee for the privatisation of the postal system. 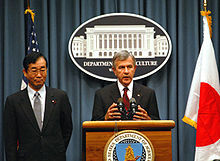 In 2006, then prime minister Shinzō Abe appointed Matsuoka as the Minister of Agriculture, Forestry and Fisheries. He worked on some political issues such as Free Trade Agreements with Australia and the beef import problem with the United States. Matsuoka received much attention when he announced a plan to make certifications for Japanese food restaurants outside Japan. He got this idea from the Denominazione di origine controllata system in Italy and hoped that this might distinguish pseudo-Japanese food restaurants from genuine ones. Many foreign media criticized this system as inappropriate, and named the system "sushi police." He retracted his plan and made a more moderate proposal. Matsuoka was affiliated to the openly revisionist lobby Nippon Kaigi. Prior to his death, he faced questions over high utility expenses in a rent-free office - he had claimed more than 28 million yen ($236,600, £118,300). Matsuoka had previously apologized for failing to declare political donations. He reported over 5 million yen ($48,000 USD) for utility expenses in 2005. This expense was questioned by the press, since Matsuoka had a very small office. However, Matsuoka said that it had been paid for purified water, explaining that people rarely drink tap water. On 28 May 2007, hours before facing questioning in the Diet (parliament), he committed suicide by hanging in his Tokyo apartment and died in Keio University hospital in Tokyo. Norihiko Akagi was appointed his successor on 1 June after provisional Minister Masatoshi Wakabayashi. Matsuoka's Vice Minister, Taku Yamamoto, said on 20 June that Matsuoka had used the money on Asakusa geisha, Japanese press reported, but Yamamoto retracted his comments the next day, saying it was only a joke. ^ "candidates". Our campaigns. Retrieved 13 January 2013. ^ "Japanese minister commits suicide". The Guardian. 28 May 2007. Retrieved 13 January 2013. This page was last edited on 26 February 2019, at 00:43 (UTC).